Whenever you access cards from R&D, you and the Corp secretly spend 0credit, 1credit or 2credit. Reveal spent credits. If you and the Corp spent the same number of credits, access 1 additional card from R&D. 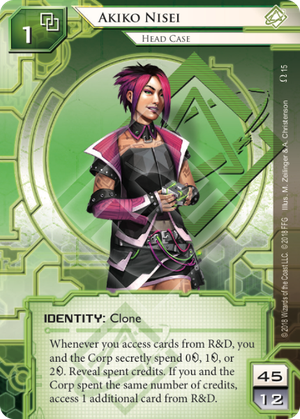 Here's a bit of lore from The Worlds of Netrunner, page 73, "There were two Nisei clones before her, and what became of them is uncertain. As you might already know, Jinteki often names its prototype clones alphabetically, so Caprice must be the third of her line.